Marine ecologists have discovered the value of GoPro underwater cameras. In this video, Michael Gil’s GoPro is attacked by a hungry triggerfish (Pseudobalistes flavimarginatus). Read Michael’s description of the event below from his blog. HT to Adrian Stier and thanks to Michael. To pick up where I left off, after the Great Vermetid Surveys of 2012 (see previous posts), for the past few weeks I have been focusing my efforts on deploying several field experiments out here on the island of Moorea in French Polynesia. These experiments are part of my dissertation research, and this summer in particular, I am looking at the effects of coral reef habitat loss and isolation as well as nutrient pollution on herbivory. Herbivory is essential on coral reefs, because it helps to control the abundance algae, which can outcompete coral and take over reefs, with drastic ecological consequences (simply put, from teeming coral reefs to slime). One of our first focuses is to look at the relationship between distance from the reef and herbivory. The assumption is that herbivorous fish are scared to travel across open sand flat to find food, because they don’t want to get gobbled up by a predator or speared by a fisherman. This ‘fear effect’ could have very important implications for reef habitat loss and fragmentation that result from natural and human-driven processes. So, for one of our experiments, we have created an “algae hors d’oeuvre platter” (i.e., a cinder block with a variety of algae tied to it), which we place at 5 different distances from the reef and video tape what happens. This approach allows us not only to get a sense of how herbivory may change with distance but also tells us who is doing the eating—what species, what size, how much eating etc. After a few weeks of running these trials, we are starting to get some interesting results and also some surprises. The best so far happened two days ago, when we returned to our cameras after leaving them for 4 hours. This time, we noticed that one of the far cameras (30 meters from the reef) was now facing the sky instead of the algae hors d’oeuvre platter. This was upsetting, because it meant that we did not get the full 4 hour observation period for that unit, but we were happy that the camera was still there. We assumed that the current, which had picked up that afternoon, could have been the culprit, but fortunately the camera was still recording when we arrived, so we knew that whatever caused the camera to move was caught on video. So, we took the camera back to the lab to analyze the video. 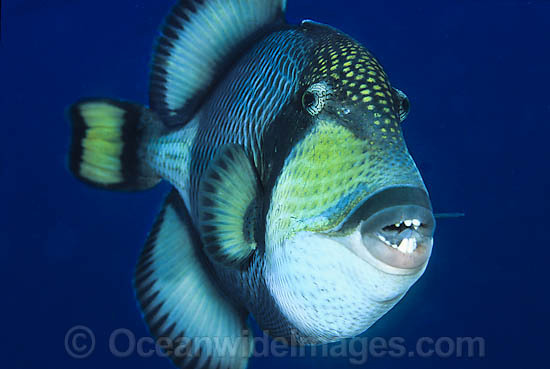 The hungry animal featured in the video is called a triggerfish, a Yellowmargin triggerfish to be exact, and it primarily eats sea urchins and shellfish (hence the impressive/grotesque teeth). As evidenced by the video, these guys can be quite aggressive and bitey—lucky for me, the GoPro camera housing stood up to the challenge, except for a bit of chipped plastic. On a side note, a close but much, much larger relative of the Yellowmargin triggerfish, the aptly named Titan triggerfish (measuring nearly 3 ft long), attacked me during a dive in January. This entry was posted on Wednesday, June 27th, 2012 at 6:45 am. It is filed under Blog and tagged with coral reef. You can follow any responses to this entry through the RSS 2.0 feed. Saw this on Twitter and thought you might like to contribute some footage to the project. Carin Anne Bondar ? @DrBondar cheers! RT @wevideo: @drbondar that’s a great project you’ve got going on for scientists and biologists http://ow.ly/bQ5No Thanks.